Eating a Double Double in Dubai sounds dreamy—but Craig Stevens' scheme eventually fell through. A Southern California man was accused of defrauding investors by selling bogus In-N-Out franchises via email. The 55-year-old con artist, Craig Stevens, started baiting investors in the Middle East beginning in June of 2014. Stevens sent out emails telling people that In-N-Out franchises were available for $150,000 per location, with royalties costing an additional $250,000 a year. Through peddling bogus In-N-Outs, Stevens made $4.27 million. According to court documents, the con man sent a faux In-N-Out licensing agreement to an investor in Lebanon. Stevens pleaded not guilty in federal court on Monday to charges of wire fraud, and is currently roaming free after paying a $10,000 bond. The problem with Stevens’ plan: Ever since it was founded in 1948, In-N-Out has been privately owned, and doesn’t have any franchise agreements with third parties. 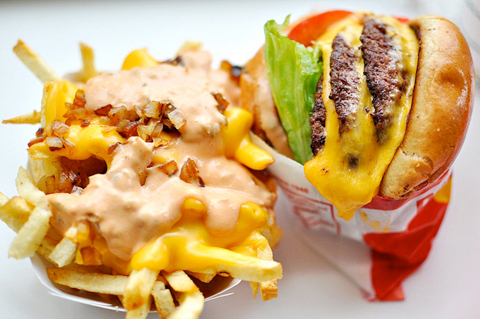 As it stands, the Southern California burger chain solely exists in California, Arizona, Nevada, Utah, and Texas. Still, we applaud Stevens for his inventiveness and ingenuity.